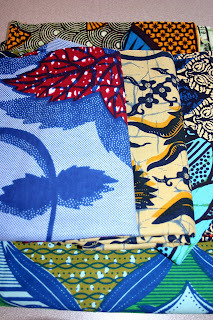 After reading Betsy's post, I was inspired to write about an upcoming grouping of tote bags that is in the works. Prior to having children, my husband and I did quite a bit of traveling to exotic locales. Instead of buying traditional souvenirs, we'd hunt for items that were native to the area or more specifically a piece of art. Even when friends or family members travel, they often bring us back a piece of local artwork. Since most of my recent travel adventures have involved a large mouse and various other characters, I have had the good fortune of receiving souvenirs brought back by family members. 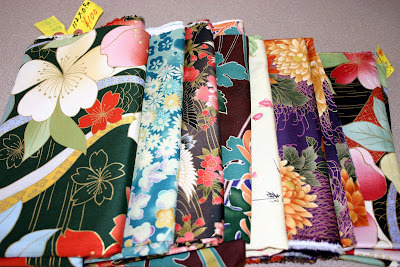 Their recent travels have included trips to Japan and Senegal and I have had the good fortune of receiving multiple yards of fabric from both of those locations.